I want to break some habits and find a new Albany workday lunch spot. (quick, not sit-down) Any recommendations? The "quick" part of Janae's question complicates things a little bit. But a lot of places offer order-ahead for lunch, so you can just stop in, pick up, and go. We're guessing you have a few suggestions. But we'll start with one of our own: Crave recently opened at Western and Quail -- we've been twice already, and we're looking forward to going again. 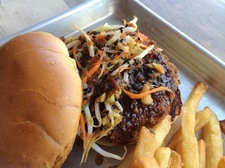 Some of the more unusual burgers are fun -- both the turkey reuben and kung pao shrimp burgers we've tried have been packed with interesting flavors. OK, your turn. Got a suggestion for Janae? Please share! (1) Szechuan Pepper-Salt Shrimp at Ocean Palace. Lunch special comes with wonton or hot and sour soup. A steal, for under seven bucks. (2) Noodle soup with fried chicken wings at Taiwan Noodle . You get the house made noodles, together with four perfect chicken wings (with ginger, garlic, anise, chili). Soup dumplings are also good. (3) Pickled cabbage and pork fried dumplings at Northeast Dumpling house. Come with a friend, and order some sides (meat sticks, cucumber and black fungus salad, or homemade kimchi). (4) Jerk chicken or curry chicken lunch special with plantains at the Hot Spot Jamaican restaurant. Meat and veggie patties are also good. (5) Cholo bature at Parivar. Delicious, but plan for a nap afterward. All five places are on Central ave. A bit of googling will get you the addresses. Sounds like a perfect job for a food truck! The food truck scene has been improving drastically over the years and there's always a good selection to choose from. In downtown Albany they're located on Washington Ave. along West Capital Park. And now that the ESP has a farmers market a couple times a week, there are even MORE food trucks to be found along the walkways of the Plaza. I agree that to stay out of the lunch rut, it helps to make some call ahead orders for"sit down" restaurants and then just go pick your lunch up. The Pearl St. diner will easily accommodate call ahead orders and are able to whip them up really quickly (so you usually can have it ready for you even if you call just 10 mins. ahead). They post their specials on Facebook each day (the Greek specials are usually a good choice). The Hollow on Pearl St. also accommodates call ahead orders. I'll call about 15-20 minutes before I want lunch and it's there waiting for me. They have sweet potato fries; and that will make any bad day a little better (or induce a nap). Mug Shots on James St. for salads, soups, and sandwiches. Zachary's on State St. has some prepared sandwiches, soups, and mac and cheese (but you really want to go there for the cupcakes). I just discovered The French Press cafe a few weeks ago - it's next to McGeary's. I love it! Great for coffee, but their food is fantastic too. Crepes, either sweet or savory, and sandwiches on very nice baguettes. You can sit there or take them to go. Check out Healthy in a Hurry on Lark Street, across from Hollywood Cafe. Lots of options, in general, but a lot of local ingredients, fresh foods, and vegetarian meals. Trader Joe's - Run and pick up a salad, sushi, and a drink. Eat in the car under a shady tree. Don't forget the take out options at Parivar on Central Ave by Grandma's Country Kitchen, and the take out at the Chinese Market a little further up Central Ave. Both are delicious and outside of the norm for lunch food. - Deli Mill (on Maiden Lane) â€“ Solid sandwiches & salads and hugely popular Buffalo Chicken wraps on Wednesdays. - Sandwiches to Go (also on Maiden Lane) - Best rye bread in town. - Mug Shots â€“ Nice variety of salads and sandwiches (but donâ€™t leave the front door open on a hot day or you risk the wrath of the women in charge). - Mirandaâ€™s â€“ Solid sandwiches. - Mauriceâ€™s/Soho Wraps â€“ Excellent roast beef (dipped in jus). - The Vault (in 100 State hidden back by the elevators) - Outstanding burritos and wraps. - Capitol Melts on State St. - The grilled cheeses are very good (and varied), but just one will leave you hungry. - Saati is indeed excellent, though a bit pricier than some of the nearby alternatives. - City Beer Hall - Everything is good and they have a killer deck. - Amo La Bella - Great chicken Parm, not expensive and seriously old-school atmosphere. - Cardonaâ€™s â€“ Best sandwiches within city limits. - The Fountain â€“ Outstanding pizza. - Anton's (on New Scotland by St. Peters) - Quality gyros. Honest Weight. Plenty of healthy options you can eat in the cafÃ© or take out. If your are open to vegan (delicious enough for an omnivore), there is The Brakes Coffeehouse & Provisions. 227 Lark St. Fresh, local, sustainable food. Try the vegan BLT, the Bacon Bad. Either of the Fiorellos on Western. The Fiorellos next to DC's roasts beef in house. The other Fiorellos bakes the bread in house. Both make terrific subs that are much better quality than Subway(or the awful DiBellas) and won't cost you much more than 6 bucks. A steal. I like to call ahead to Kinnaree on Lark St. and bring back an order, or 2, of the fresh spring rolls - the ones that are NOT deep fried. I also feel like I'm eating healthy when I pick up the Duck Salad. In the colder weather, they have some great soups like Tom Yum or their house specialty Home Made soup - S7. Yum! I love the falafel pita from Mamouns - 280 Central Ave Albany and if I'm starving I get the plate with the side of hummus. So fantastic.